Many things have happened within the last two/three months. Things we planned to do and things we didn't want to happen, but it did! I haven't written a home update in a while but I did write a little update and tour of Mia and Elliw's bedrooms not so long ago. We have managed to sort the garden out but I haven't managed to take any photos yet so that update will be on the blog soon! We finally wallpapered the living. We were supposed to do this over a year ago mind you! But we are too lazy in the evenings once the girls fall asleep. One week we finally did it. My partner took a day off work when the girls were in school (before the summer holidays) and we did it in just a couple of hours. Originally we had chosen to go for a green theme for the living room but that has changed. We decided to go for a teal/sky blue kind of theme. Please ignore all the birthday cards! I have been to lazy to take them down. Most things you see in this photo were bargains. We bought the Floor Lamp from IKEA for only £5.25, 'Home is where the heart is' frame from Matalan Sale at only £3, Brown bookshelf for £5, second hand and the phase with sticks for only £3 from the charity shop. I am quite pleased with how the living room has turned out. We have a blue rug too, we will soon be saving for new fabric sofas as we are not keen on these leather ones anymore but I am thinking for now, I could cover the leather sofas with white throws. Our living room feels really homely and cosy. All we need to do now is re-paint, buy new sofas, put some shelves and more photos up and it will be perfect for us. 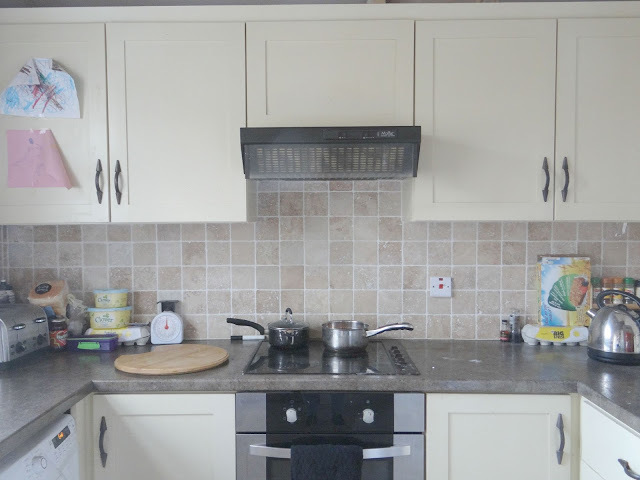 Our kitchen isn't how I want it at the moment. It isn't usually lay out like this. We have just got the basics out at the moment and all kept under the cupboards. 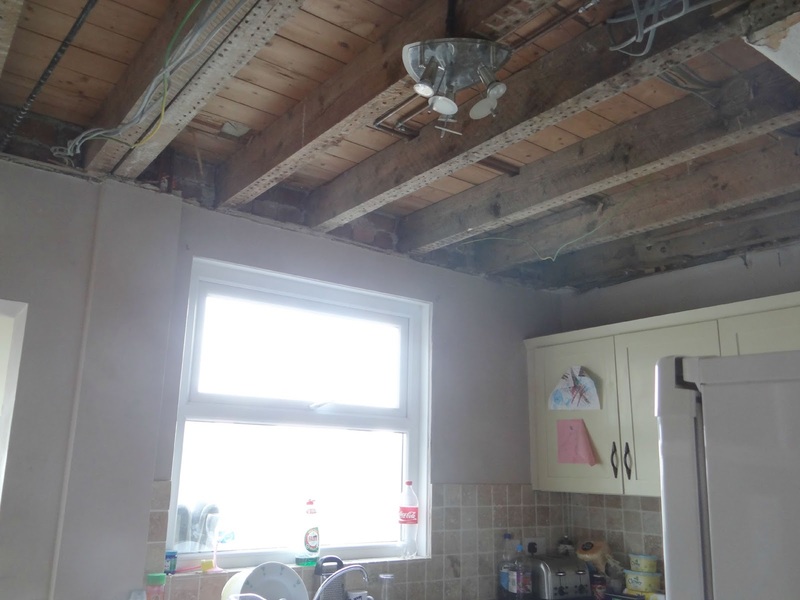 Not so long ago, a day before my birthday, the kitchen ceiling decided to collapse. As you can probably think, most of my stuff were covered in dust, many things I had to chuck and the rest I had to wash. Many of my kitchen appliances are in boxes in the hallway or the dining room. We have decided to leave the ceiling how it is for the meantime because we started to get a lot of leaks from the bathroom, which is above the kitchen. Luckily, my partner is a plumber so he knew what to do and we decided to take our bath out, put a new bath in and re-tile. We will be doing the rest of the bathroom in the next few months. The bathroom hasn't finished yet but the tiles are up. Actually, as I am writing this, the bath has just been fitted but I will update you all of our new bathroom in the next few weeks once it is all finished. We are really pleased in how the bathroom has turned out so far and so glad the house is slowly getting to how we want it. 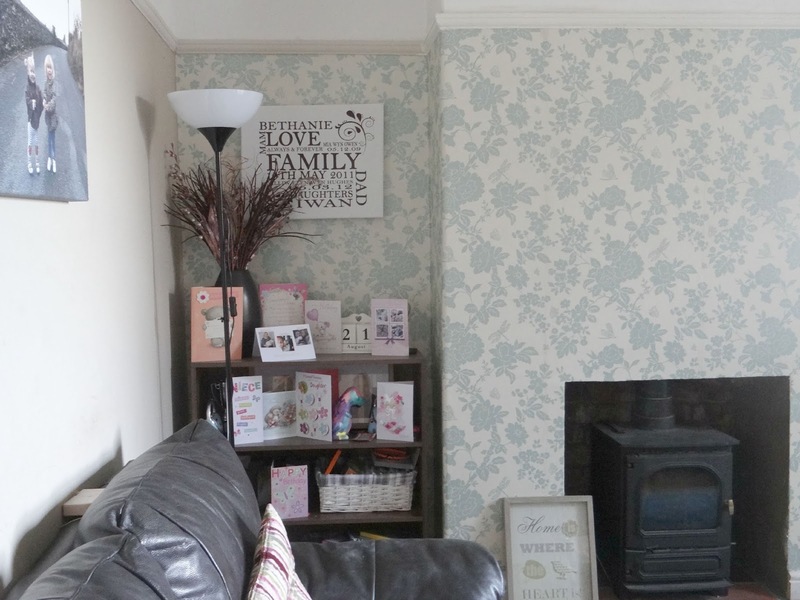 I am yet to start the girls, playroom, front room and our bedroom sorted as they only need re-decorating and I love doing that. That is what we have been up to recently! For the next few weeks there will be a few home updates and home interior posts coming up. I can't wait to share my home and new ideas with you all. Wow! It looks like you have been busy! Your living room looks gorgeous! I do love the wallpaper! It's all looking so good! That wallpaper is lovely and the bathroom's looking great so far. It looks so simple and lovely! Thank you for hosting #justanotherlinky!